FloodSmart Parramatta offers a free flood warning service that provides early warning messages, to residents and businesses, when we think flooding is likely. You can choose to receive warning messages in any combination of text, email, or automated voice message. There are seven warning areas that cover different communities in the City of Parramatta. Each warning area will receive its own individual warning message in the event of a possible flood. This allows communities to know that the predicted flooding is relevant to them. You can sign up to warnings for your home, workplace, children’s school or any area that interests you in the City of Parramatta local government area. You can also sign up to more than one warning area. Flood warnings will be issued by the Early Warning Network. For changes to your account once signed up, or to unsubscribe, go to the Early Warning Network website. FloodSmart Parramatta currently has seven warning areas and your address will be used to find the right one for you. Warning areas have been created for communities which are affected at the same time and from the same source. These warning areas may change with new information and we will contact you through your FloodSmart Parramatta account if this happens. Properties near Toongabbie Creek in Old Toongabbie, Winston Hills and Northmead. When you receive a flood warning message from FloodSmart Parramatta, it will outline the expected level of flood severity which could be minor, moderate or major for your area. This is our way of telling you how bad a flood may be. To understand what actions you need to take, it will be helpful to know if your property or nearby areas are at risk. Go to the Know Your Flood Risk page to view an interactive map of flood risk areas. High risk areas may experience property flooding. High and Medium risk areas may experience property flooding. Flood Warning Severity – Every flood is different! 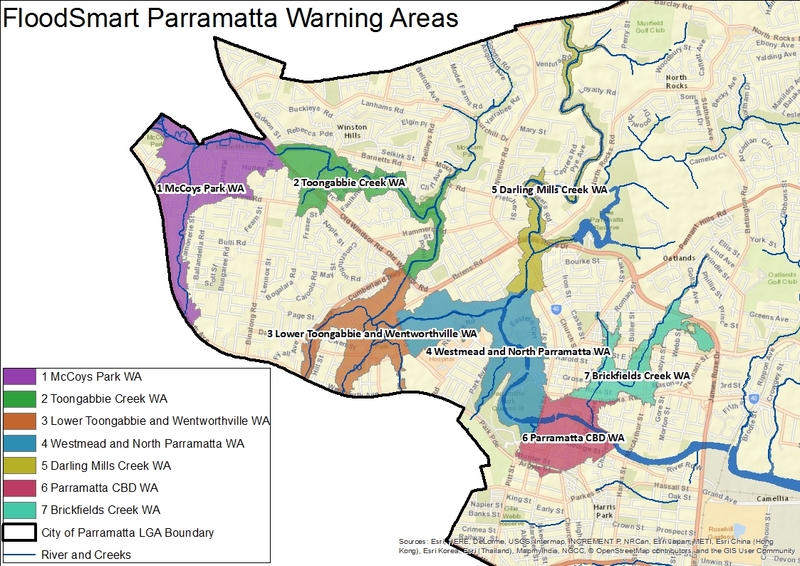 FloodSmart Parramatta aims to predict how significant a flood will be for you. When you receive a warning message for your community it will explain Flood Severity, which is categorised as Minor, Moderate or Major to help you take appropriate actions. Warning Area – These are communities which are affected by flooding from the same source. Splitting the river system up into warning areas allows us to provide you with a targeted warning message for your area. Everyone in a warning area will receive the same message and you will need to know your properties risk area to understand what it means for you. For example, a Minor flood warning will not mean flooding for everyone, only those in the high risk areas. Risk Area – If your house is flood prone it will fall within one of the risk areas shown on the Know Your Flood Risk page and will be; High, Medium or Low risk. Risk Areas are a way of describing how often your property might flood and how significant that flooding may be. Knowing your risk area will help you plan the right response to flooding.